Local fitness instructor David Hogg contacted me recently for some advice regarding his beautiful Cavapoo called Daisy, she was exhibiting some over excitement around other dogs, extremely friendly, however, she was over social and just needed some impulse control when in the presence of other dogs. 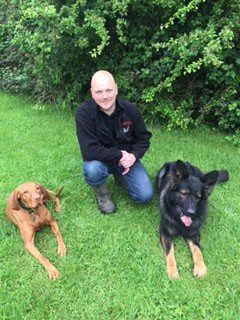 A one to one session was arranged and we worked with Daisy and two of my own dogs called Ruby and Breguet. The session went well with some good results and a plan of action was put in place. The next day I received a lovely email thanking me and a written testimonial which I have copied below. “I called David to help me train my 11 month old Cavapoo as I was having a few little problems with. David was very professional and listened to the issues I was having and very quickly gave me some techniques to help resolve them. David’s interaction with his dogs and Daisy was excellent giving us the confidence we both needed. I would highly recommend one to one training with David as his knowledge and interaction is fantastic”. Daisy’s owner David is determined to continue working with her to just calm her excitement around other dogs who she just wants to ‘give a big kiss’. I highly recommend David’s business which consists of his fantastic mobile gym, his website is http://www.hoggsfitness.co.uk and if you book a session with him you may even get to meet the beautiful Daisy.